The fast Swedish wing player Jennie Johansson trying to break through a clinging defensive player at a national game. Photo by Atticus Overbay, LA Team Handball photographer. It goes by many names; handball, team handball, Olympic handball, European team handball and European handball. In Denmark, where I am from, we just call it “håndbold”. 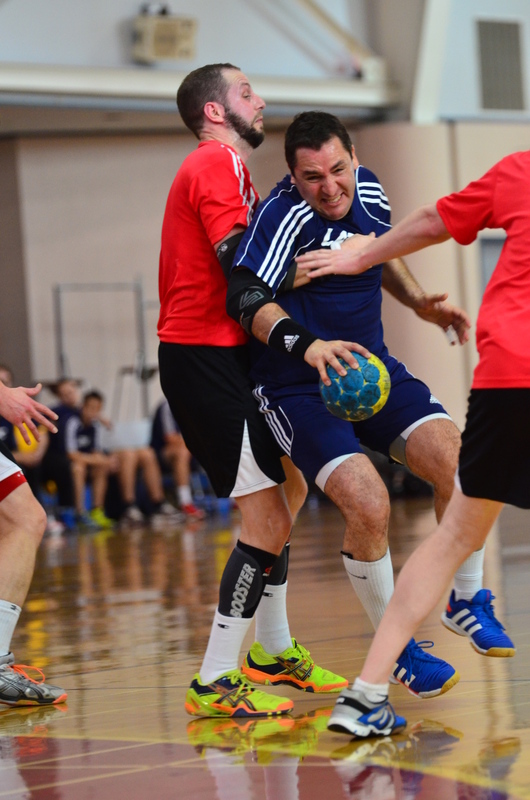 In this article, let’s stick with team handball to avoid confusion. Team handball is my personal favorite sport – to play and to watch – and I have loved it ever since I started playing at the age of five. There is no sport comes close to it. It is a contact sport with speed, strength, and a lot of goals. What’s not to love? Honestly, I’m confused why Americans have yet to embrace this amazing sport. If you consider yourself a sports lover and like basketball, football, or both, I challenge you to watch three professional games and not fall in love with the sport. At the very least, you should feel intrigued. Putting the pen to paper, I quickly came to realize that I had no real factual knowledge of the history of this sport, besides the fact that the sport was invented in Denmark. So, I decided to do some research at the official Danish handball sites (DGI.dk and DHF.dk). The results reveal a 118-year-old history about both the game and the rules, and even a big issue with some Nazi Germans. The scene is Denmark, the years before the turn of the 19th century; the age of industry is expanding rapidly. English sports are getting increasingly more popular throughout Denmark – especially in the capital city, Copenhagen. In 1897, 118 years ago, Lieutenant, Rasmus Nicolai Ernst, writes down the rules of handball although, Holger Nielsen, lieutenant colonel, is the man mostly known to be the originator of the sport. At Ordrup Latin- og Realskole (today Ordrup Gymnasium) Nielsen’s students are really starting to shape the game when Nielsen, in 1898, starts forbidding his students to kick the balls during P.E. Five years later, Nielsen and his students are provided with their first opportunity to actually showcase the sport. At that time, handball is played outside, on a grass field, and is made up of eleven players on each team (compared to today’s 7 players). A journalist writes a comment in the newspaper that it particularly looks like the American Basketball. In the very beginning, team handball is meant only for boys. However, in 1906 girls start to play at a school in the town Fredericia, which, on a side-note, is the city where I played just a few years ago. In the following years, special rules for women are developed. But, in 1923, the two sexes receive mutual rules. In the 1920’s, people are beginning to develop team handball as a winter-sport whereas, in 1920, the first real handball club, Efterslægtens Boldklub, is founded. One year later, the first indoor tournament takes place in Copenhagen. In 1933, problems between the Danish handball federation (Dansk Håndbold Forbund) and the Germans arise when the Nazis gain power over Germany, although Denmark refrains from getting into any confrontations. However, when the Germans, during the Olympics in 1936, claim to have invented the game of handball, Denmark cannot keep quiet any longer. Therefore, they decide to protest against the International Amateur Handball Federation (IAHF), but with no luck at the time. Today, Denmark is widely recognized as the founding country of the sport and has further won a great deal of medals both on the women’s and the men’s side. However, world championship and Olympic medals are still yet to find their way to the U.S. Reality is that team handball is out-played by the greater sports in the U.S. such as football, baseball, basketball, ice hockey, and even soccer. Team handball is indeed low on the list of popular sports in the U.S. Why this is so, is a mystery to me. It incorporates the best of most of the popular sports: the high level of contact from football, dribbles and the cool, creative shots from basketball, and the fast breaks from soccer. Team Handball in the U.S. In 2013, the U.S. took a big step and reinstated the residence program in Auburn, Alabama. Players from across the country found their way to Alabama to play handball everyday, in an effort to build better national teams and get the U.S. on the handball map. The U.S., however, is not without achievements. According to Julito Sainz, first assistant coach of the women senior national team and head coach for the women junior national team, qualifying to seven Olympics have definitely been the biggest achievements for the U.S. national teams. The men participated in the Olympics in 1936, 1972, 1976, 1984, 1988, and 1996 and the women participated in 1984, 1988, 1992, and 1996. Finally, Sainz explains that it is not Americans, but Europeans who develop most club teams in the U.S. because they miss playing. Therefore, team handball is not played by kids, or taught in schools so they can develop an attachment to the sport like other popular sports in the U.S. Since the government does not subsidize team handball, I asked Coach Sainz how the national teams are funded. In order to gain more attention, and donations, I asked Sainz what is and has been done to promote team handball. “The Federation is doing a good job to promote team handball. At Nationals, games are now televised for live streaming via the Internet. The IHF has also signed with BeIn Sport so you can now see championships on satellite TV,” he responded with content. On a final note, I asked Coach Sainz, as the founder of Los Angeles Women’s Team Handball Club (LAWTHC), what should be done to make the sport more popular in the U.S. He didn’t even need a minute to think about his answer.